With the close of 2013, everyone is making their predictions for 2014 in terms of weather, sports and politics. Well, the recruiting industry is no different. As you and other recruiters face 2014, there are many changes you need to make in order to recruit 2014 job candidates. These job seekers need to feel like they’re important, that they could be a vital contributor to the business and that you’re the best to work for in the industry. As ere.net puts it, you need to attract candidates versus recruiting in 2014. 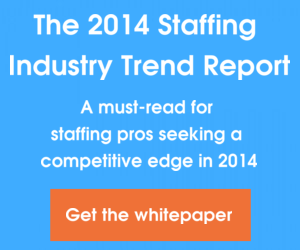 Fortunately, they provide a few suggestions as to how you can stay on top of the 2014 recruiting trends. This new year, don’t think of recruiting as recruiting. Rather, consider it all marketing. This may require you to shift your focus and your techniques, but the trade off will be worth it. Change your pitch, verbiage and content to language that resonates with your target recruit, suggests ere.net. You’ll also need to build your company brand. Invest time and resources into social media, blogs and profiles on career and job sites like Spark Hire. You’ll not only receive more exposure, but you’ll be able to show a more personal side to your business, thereby building the company brand. More importantly, you’ll create a channel in which you can dialogue with prospective job candidates, an enticing factor as they consider their options and open job opportunities. We’ve covered this before at Spark Hire, and you’ll find that in 2014, more and more recruiters will be depending on big data, according to ere.net. Why? Because big data answers the big questions. Gather data on your current employees, and look for trends. You may notice that a certain demographic have stayed with the company longer or that a specific character trait is necessary to longevity and success within your company. Once you determine these trends, you’ll be able to make better hiring decisions. And once you’ve found these job candidates, it’s important to invest in them as new hires and long-term employees. With that, training during the first few weeks is vital. As they make contributions to the team, give them praise and a pat on the back. Finally, rerecruit them by providing them with the best offers, i.e. promotions, pay increases and a sense that they’re making a big impact right where they are. Part of recruiting is keeping your top talent from moving to your competition. As you can see, 2014 is all about job candidates and their experience. The next two trends, which we’ll cover soon, are no different — stay tuned! What do you think of these predicted recruiting changes? Should companies change their recruiting efforts to cater to the job candidates? Share now in our comments!